Hello and welcome to the inaugural episode of 5 things – an independent web series dedicated to answering the 5 burning tech questions you have about technologies and workflows in the media creation space. Tech stuff I dig, and how it’s used. I’m your host Michael Kammes. 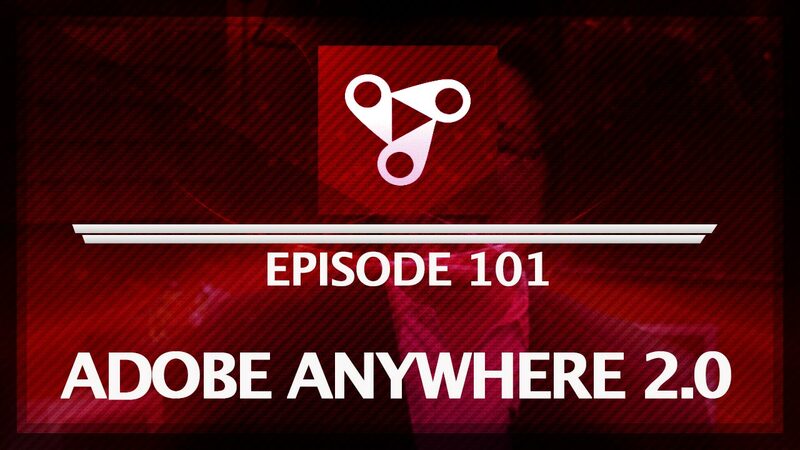 This episode we’ll be looking at one of my favorite new technologies: Adobe Anywhere. Let’s get started. Yes, I’ll start out basic for those few who are uninitiated. 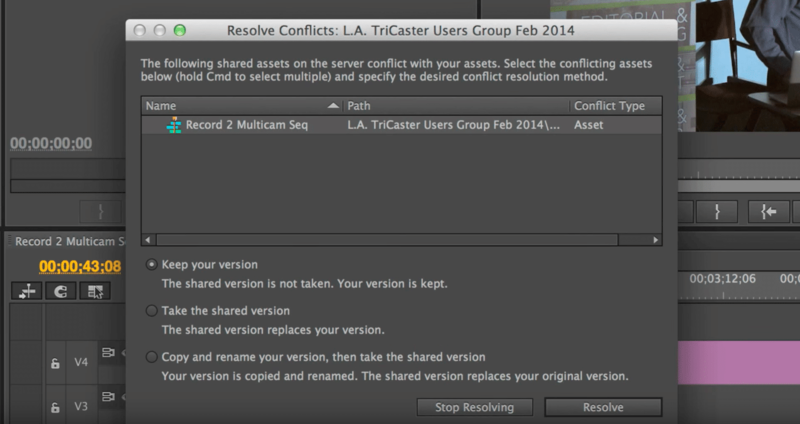 Anywhere is Adobe’s Enterprise class solution for collaborative and remote editing. I know, marketing gobbledegook, right? Here’s what it boils down to: Multiple editors can now open the same project (now called a Production) at the same time. They use the same media and timelines within that production, as well as share and receive these changes from other editors – on demand. No shuttling around bins or project files. Multiple editors, working together in real time. 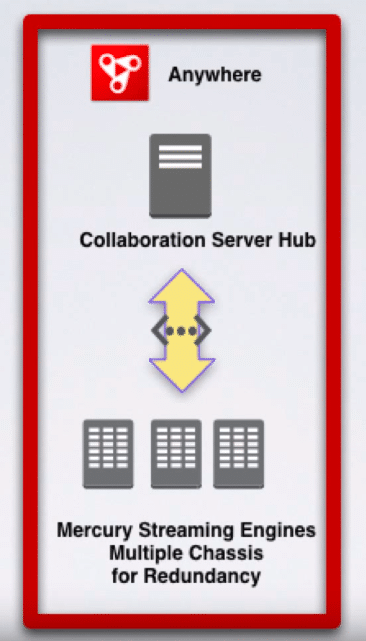 So that addresses the collaboration, what about ‘remote’ part of the equation? Remote, in this case, is the ability to utilize the Production’s media and timelines outside of the 4 walls of your facility and away from where the media is housed. This means that with any place that has a decent internet connection, you can log in on your own computer and edit the media as if you were sitting next to the storage. How this differs from most is that there is not an offline/online media or proxy workflow. Adobe Anywhere plays a real-time stream of the high res media to your system. Anywhere throttles the quality of the media being streamed to your system to accommodate the available bandwidth you’ve got. All rendering is done on the Anywhere system and streamed out to your remote system when you hit play. These 3 GPU accelerated servers -called Mercury Streaming Engines are accompanied by at least 1 traffic cop, known as the Collaboration Hub. These 4 systems enable the core functionality of Adobe Anywhere….and this core system supports about a dozen users. ….but there is a lot more to it than that. Unlike some other remote collaboration solutions, like Avid Interplay Sphere, Adobe Anywhere relies heavily on 3rd parties to complete the build-out of a fully functional base system. This means having a fast, centralized storage pool that can be utilized by the Anywhere servers. This needs to be some beefy storage; a Drobo and a USB drive ain’t gonna cut it. Next, you’re going to need Asset management. I know, not the most exciting topic, but in almost all cases – completely necessary, especially for those who are utilizing the remote editing functionality. See, Adobe has a written a robust REST API and has relegated many of the creature comforts of media management to 3rd party applications accessing the API. You’ll also need a decent internet connection both up and down from the facility where Anywhere is living, as well as from the remote site where you’ll be editing. And don’t forget a VPN, lest you invite unscrupulous folks to partake in your media. 3. What is the performance like? For the product being a year old, pretty good. Snappy and responsive, rarely any lag during shuttling or quick keyboard combinations. I’m finding 25mb/s (~3MB/s) to be a good baseline for a remote editing system. Your local coffee shop probably won’t deliver the speed you’re going to need, so choose your fortress of editing solitude carefully. Oh, if you’re doing multi-cam, you’re in luck. Because all rendering is being done on the Anywhere system, all media streamed to your editing system is one, single video stream. This is transparent to the editor, but drastically reduces the amount of data needed to be streamed to your computer. Currently, Anywhere supports Premiere Pro CC, Prelude CC, and there is a tech preview of After Effects currently available. There are some other caveats, however. Plug-ins need to be on the client system and all of the Adobe Anywhere servers, as well as any fonts. Also, exports from your timeline are performed and saved on the Adobe Anywhere servers, not on your local machine. Also, a big one is being able to actually look at the centralized storage pool when you’re remote…this cannot be done without Asset Management. A license to use Adobe Anywhere, much like the rest of the creative Adobe applications, is at least partly subscription based. However, this subscription – as well as the server software to install on the aforementioned collaboration hubs and render nodes – is only available through a sanctioned Adobe Anywhere integrator…like our sponsor, Key Code Media. Given the complexity of a full deployment, Adobe has set up rigorous requirements in order to ensure that these systems are deployed by integrators who know what they are doing. 5. The question I get asked the most – How much does it cost? Let’s go on the assumption you’re building a system from scratch that supports a dozen users. First off, you’ll need a Creative Cloud plan. This can be as little as $360 a year, depending on your plan. The Adobe Anywhere subscription part of the equation is $999 per each user, per year. The Adobe Anywhere server software is, as of now, free – but again, only available to integrators. If we now look at the hardware needed to run the Anywhere software, the minimum you’re going to need to spend for a qualified, Adobe sanctioned 4 server system will be $60,000. 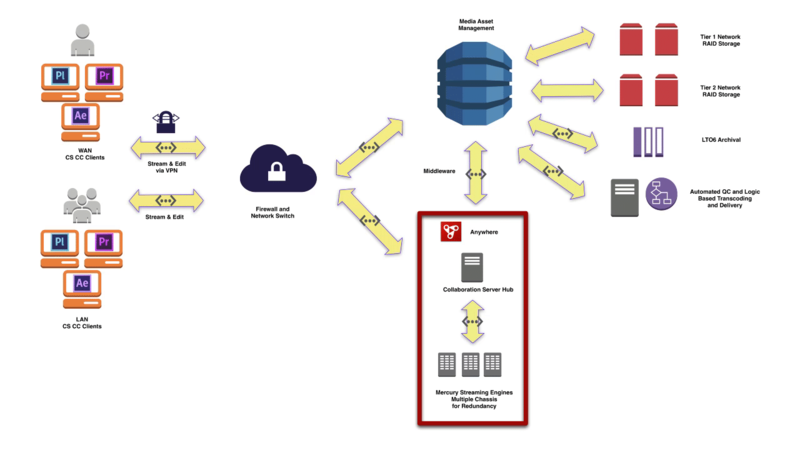 I’ve been involved in the building, integration and support of several Anywhere deployments. 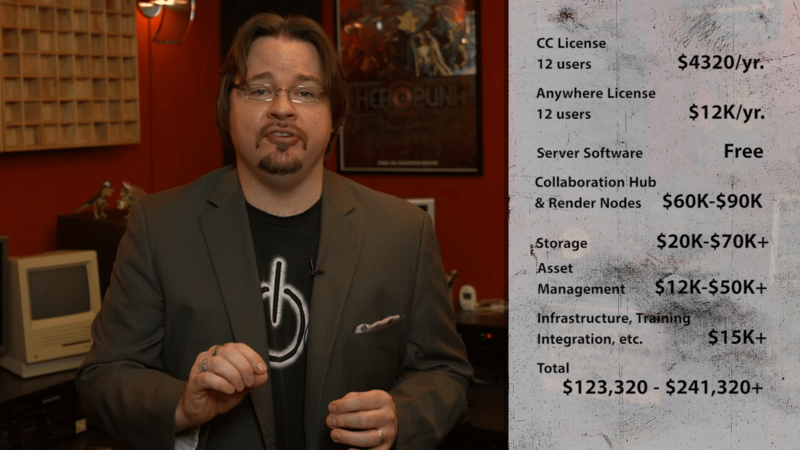 The weakest link has always been the least expensive servers for the Collaboration Hub and Render Nodes. Go with a name brand, like Dell or HP. Skip Supermicro. You’re going to pay a bit more, but the availability of parts, the warranty and support far outweigh the initial savings on cheap parts. You’ll thank me later. We now need to add sanctioned storage to the mix. Adobe has qualified storage, such as Isilon, Quantum, Harmonic and other enterprise storage platforms. These solutions will easily be $70,000+. I have no doubt that less expensive storage, at some point, will be qualified, but even those systems will be $20,000+ minimum. Keep in mind folks, you need fast video storage, not fast data storage, which tends to thin the herd out quickly. Asset Management is an often overlooked component. If you were at NAB this year, many manufacturers had Panels for Anywhere access. Vizrt, Apace, Levels Beyond, and Axle – among others. These solutions range from $12,000 up to $50,000 or more. Lastly, none of these numbers include additional infrastructure additions, like switches, VPNs…or other overlooked costs, such as installation or training. As you can see, $150,000 for a complete, turnkey entry level Anywhere system is not uncommon. Most deployments will easily be an additional $75,000 if not more. There is a ton more info on Adobe Anywhere. Have more queries than just these 5 questions? Ask me in the Comments section. Also, please subscribe and share this tech goodness with the rest of your techie friends. I plan to be back in 2 weeks with another 5 things. Until the next episode: learn more, do more – thanks for watching. The post 5 THINGS: on Adobe Anywhere appeared first on 5 THINGS - Simplifying Film, TV, and Media Technology.